Strauss says the England Test team need to lift it "a notch or two"
A proposed new 100-ball competition will be aimed "at mums and kids during the summer holidays", says England director of cricket Andrew Strauss. The England and Wales Cricket Board wants to introduce the format into its new eight-team, city-based tournament. "What we're trying to do is appeal to a new audience, people that aren't traditional cricket fans," said Strauss. "We want to make the game as simple as possible for them to understand." The concept could see innings consist of 15 traditional six-ball overs, and a final 10-ball over. That would be 20 balls shorter than Twenty20 matches. Southampton, Birmingham, Leeds, London, Manchester, Cardiff and Nottingham have been selected as venues for the five-week competition, which will start in 2020. The new competition will take place alongside the existing T20 Blast which is expected to be unaffected by the proposed format changes. 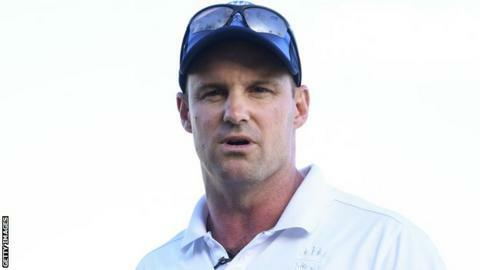 "T20 has been unbelievably successful and it has established a very strong audience now," former England captain Strauss told BBC Radio 5 Live's Sportsweek programme. "We want that audience but a different audience as well, who perhaps would like things slightly different. That's the driver behind this idea. "T20 has become a longer and longer format of the game. It is more than four hours in a lot of parts of the world. "We want kids to be able to go to bed earlier and it is worth saying it is going to be on terrestrial TV. We want the more casual audience." However, former England bowler Chris Tremlett said he was "not sure what's wrong with T20 and why we're trying to get funky," in a post on Twitter. "The longer form of the game is what needs spicing up, not the shorter form," he added. England were beaten 4-0 in Australia before going on to lose 1-0 to New Zealand as they failed to win a Test match while on tour during the winter. Strauss described the results of the Test team - captained by Joe Root - as "disappointing" and said the side "haven't moved forward over the winter". "Winning away from home is a real problem for us and has been for decades," he said. "We need to be much sharper in terms of how we approach this and be a bit more creative. "For the players themselves, it's about lifting it a notch or two. Those younger guys that have come in, they haven't grabbed their chance with both hands and that's a challenge for them to do that. "For the more senior players, we need more match-winning contributions from them as well. "Everyone is under a bit of pressure. If we want to be number one in the world then we have to win more away from home than we have previously."